Inside and out, Dupont is without question the most playful, exuberant, and inspiring TTC subway stop to visit on a warm midsummer evening. Designed by Dunlop Farrow Architects, Dupont is filled with organic curves, fluid corners, and mellow earth tones that evoke the idea of being inside a sheltered, subterranean cavern. James Sutherland’s Spadina Summer Under All Seasons graces the platform and mezzanine walls of the station with its lovely and intricate glass tilework. Count me in as a fan—I’m a sucker for spectacular representational art. Meanwhile, the twin entrances to the station take the form of delicate, golden-barred, glass bubbles that hint at the wonderland below. By the northwest entrance, Ron Baird’s massive, faintly ominous gate, Miscellaneous Hardware, guards an electrical transformer yard from interlopers. The doors reportedly take inspiration from the caps that sit atop oil tanker train cars. 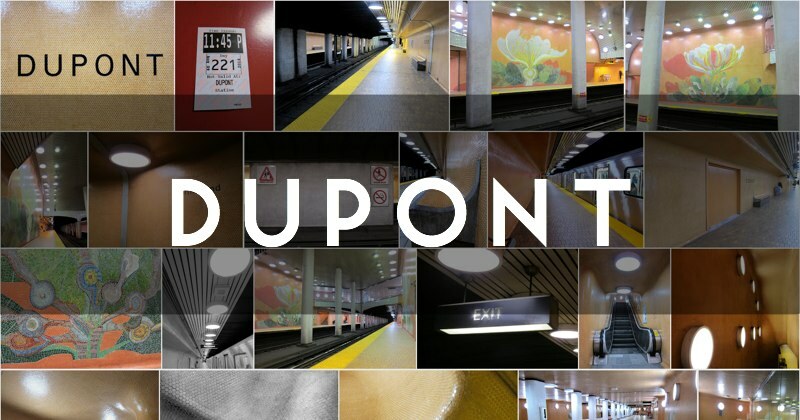 Dupont opened to lucky commuters on January 28, 1978 as part of the Spadina subway extension. What a self-assured contrast to the restraint of the older Bloor-Danforth stations... We can only wish that more stations exhibited Dupont’s panache.